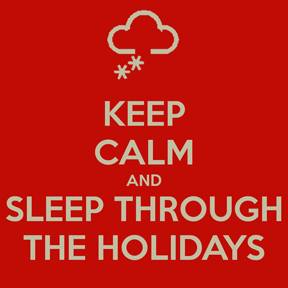 Home » Blog » Why Should You Maintain Good Sleep Habits Through the Holidays? Why Should You Maintain Good Sleep Habits Through the Holidays? Whether you’re traveling to visit relatives or hosting relatives in your own home this holiday season, it’s needless to say you’ve been busy making arrangements. But have you included maintaining healthy sleep habits in your holiday planning? It may sound unnecessary, but think about it. Holiday festivities do tend to keep everyone up late, and it should—it’s hard for families to get together to simply enjoy each other’s company these days, so why not make the most of it? But making the most of that time also means maintaining good cheer which, let’s face it, can also be hard if you’ve got relatives who tend to rub you the wrong way. And that’s why getting enough sleep is so important. Productive sleep replenishes us. It arms us with the power to absorb all the little stresses that otherwise seem to pile up until we feel overwhelmed and defeated. Without sleep, you can forget about having the patience to tolerate that one aunt who never seems to have anything nice to say. Or finding the strength to smile when you catch your three year-old niece grinding mashed potatoes into the carpet. With sleep, you’re at your best, which makes being together all the more fun for everyone. So, how can we fit more sleep into our holiday fun? If you’re traveling, we have some suggestions for you to stay rested on the road. But if you’re staying at someone’s house or having people over yourself, things can get a little tricky. It may be hard to retire when you’re ready and even harder to fall asleep if the house is still rocking with merriment. And expecting to sleep in the next morning is usually unrealistic—especially if there are little ones pattering about or you’re hoping to get an early jump on the morning shower rotation. And regardless of whether you’re visiting or hosting, you’ll want to be up to at least help with breakfast. So try and find some downtime during the day to catch some extra winks. It’s amazing what a 20-minute power nap can do. And when you are in sleep mode, try a white noise machine or app on your phone to help drown out unwanted noise. Another aspect of holiday travel that can disrupt our sleep patterns is also the hardest to overcome: jet lag. It keeps us up when we want to be down, and down when we want to be up. And the worst part of it is, the farther we travel, the worse it is. The bad news is jet lag can’t be stopped entirely. But there are ways to mitigate its effects – read more in our jet lag survival guide. And as always, follow all the rules of good sleep hygiene. Avoid sleeping pills, caffeine and alcohol before bed. Read more to better understand real vs. perceived sleep in our blog. What will you do to make sure you’re keeping up with your rest this holiday season?